Antalya holidays take you to the province known as the Turkish Riviera, so called because of its swathes of soft, sands gently caressed by warm, clear Mediterranean waters. Framed by mountains and verdant hills, cheap Antalya holidays take you to scenically beautiful area. It is the perfect destination for sun worshippers and beach lovers, and is popular with every age range from those with young families to older couples. As in most parts of Turkey, you'll find ancient ruins dotted around the place. With amphitheatres and temples, Roman baths and viaducts, there is plenty to see. 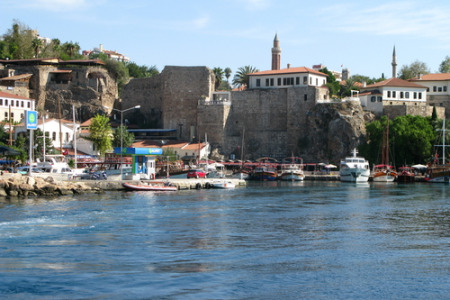 Antalya holidays provide high standards of accommodation and service. The many five star all-inclusive hotels offer particularly good value with great cuisine and excellent amenities and recreational activities. As those with families know, half board basis can be very expensive if you give in to the constant requests for snacks and drinks from nagging children. The large hotels offer good provision of children's clubs. Nightlife can be as lively or as relaxed as you wish as there is entertainment to suit all. Young folk who wish to dance the night away should head for Antalya Town which offer a high octane atmosphere from dusk until dawn. A multitude of restaurants and cafes provide food to suit all palates. Do try traditional dishes and not just kebabs. Be more adventurous and give your taste buds a treat. Shopping is always good in Turkey and for those who treat it as a hobby, delights await in Antalya Town. You'll find a labyrinth of cobbled streets filled with shops and stalls selling a wide variety of goods that are ideal for the souvenir hunter. Don't forget that haggling over the price is a national pastime. If you find a cheap Antalya holiday appealing and you wish to avoid the tiresome task of trawling through web page after web page trying to find the best deal, try our simple search facility. You'll find over three dozen travel companies competing for your custom. It is simple to use and remember, competition brings out the best bargains. Our search facility enables you to see, at a glance, the Antalya holiday that is the cheapest and the one that offers the best value for money. All you have to do to secure the holiday is make a phone call. To book the best deal, and to avoid disappointment, ring today.